I'm a pretty big fan of making lists. Shopping lists, number one priority chores list, wanderlusting lists and just things that need to get done. Lately I've been doing a lot more of the latter but I keep on running into one big brick wall, without fail I will lose all the lists I write. Shopping lists somehow always manage to fall out of my pocket or purse somewhere between my apartment and the store. We all know what goes down when that happens, someone ends up with 5 blocks of cheese, no vegetables and a bag of chips. No one wins in that game, even the grocery store because they failed to move out the perishables. As I was saying, I've been making a lot of to do lists. It usually goes like this: finally go to the department of licensing (yes, I'm getting a Washington drivers license) and just buck up and write that blog post. The number one spot usually fluctuates depending on the type of hair day I'm having. Don't tell me that sounds silly because let's be real, I'm going to be stuck with that drivers license photo for at least a few years. Little Orphan Annie hair isn't always in vogue. As you are now reading this blog post, I've obviously checked at least one thing off my list. I made "A" a complete Thai/Lao dinner a few weeks back. I would say when we go out to eat, we seem to lean towards the spicy & noodley variety. 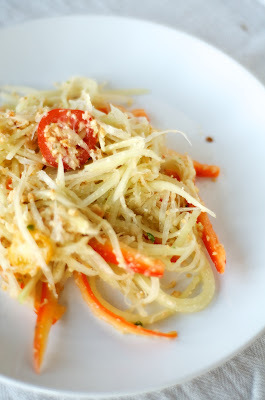 One of my favorite things he has introduced me to is green (raw) papaya salad; it's crunchy, spicy and the fish sauce makes it a bit salty too. After I've watched him make it a few times, I felt it was due time I made some too. If not only for the purpose that I could make it all just to gorge myself. The actual preparation is straightforward and simple, but I do recommend having a few specific kitchen tools. You'll want a mortar & pestle to grind together a good portion of the ingredients and a julienne mandolin doesn't hurt to have to cut up the papaya. However, if you want to make this don't go out and buy a surplus of gadgets. With some basic knife skills, you can easily chop up the papaya and (sshhhh) I've totally ground together the spices and peanuts in a small food processor. No biggie. If you want a healthy side dish with a flair of the exotic and a kick of spice, look no further. Peel the green papaya and shred with a julienne mandolin. Alternatively, slice the peeled papaya into very thin strips. Mix together with cherry tomatoes & red pepper in a large bowl. Place the roasted peanuts, garlic and thai chili in a mortar and pound to a rough paste. Add this crushed peanut mixture to the shredded papaya, tomatoes & bell pepper. In a small bowl, whisk together the fish sauce, sugar and lime juice. 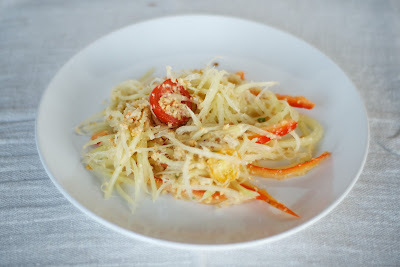 Add this to the shredded papaya, tomato, bell pepper and peanuts. Toss well. Garnish with cilantro. Serve chilled.